Learn how to personalize based on cookies. This way you can personalize for logged-in users, affiliate traffic, on-site actions, and more. Do you want to personalize for logged-in users? Maybe you identify affiliate traffic using cookies. Or maybe you fire cookies when visitor perform certain actions. In this guide, you will learn how to personalize based on existing cookies and how to set up your own cookies to create behavior-based personalizations. Note: this article is an addition to our main article about behavior-based personalization. A cookie is a small piece of data sent from a website and stored on the user's computer by the web browser. Cookies help your website remember information (e.g. items added to shopping cart, information entered in a form field,...) or record the user's browsing activity (e.g. clicking a button). Logged-in users: Existing users need to be retained, not acquired. Change your website messaging accordingly. Inform logged-in users about new and improved features, swap out your salesy content for more in-depth explanations, and change your CTAs to move users further down the funnel. Personalize based on affiliate: You don't use affiliate links, instead you drop cookies to identify who referred a visitor? With cookie-based personalization you can read the cookie-value and personalize your website accordingly. You sell accounting software and you have big affiliate network? Set an "affiliate" cookie and personalize your website by mirroring the affiliate's tone-of-voice and repeat their endorsement. Personalize both, landing page and follow up pages to reassure visitors about the trust the affiliate puts into your business. You use affiliate cookies? Create personalizations based on cookie value. For security and performance reasons, your website doesn't send cookies to Unless by default. So, to create an audience based on a cookie, you need to whitelist the cookie you want to send us by adding an extra code snippet to your Unless script. Also, bear in mind that the browser cookie can’t be set to httpOnly since we won’t be able to read the cookie or send it to our servers. Replace the value ' 'cookieNameA/B' with the actual name of your cookie. Generally, you have two options - target based on the existence of a cookie or the value of a cookie. Here, we target users for whom the cookie "isLoggedIn" is set. Here, we target users for whom the cookie "customerPlan" has the value "basic"
For the "Startup" audience, we use the cookie as a targeting condition. 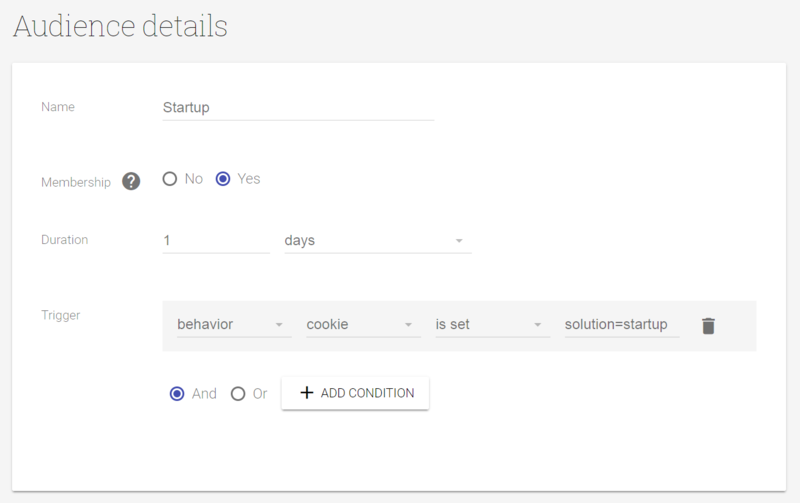 Now, we can personalize for all visitors who initially arrived on the Startup landing page.